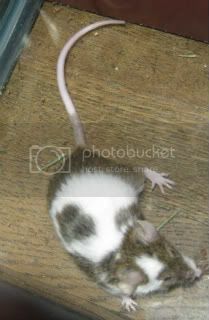 All but my female mouse Copper are new animals but I had snapped new photos of her when I took photos of Mew, my new male mouse and decided to share them. 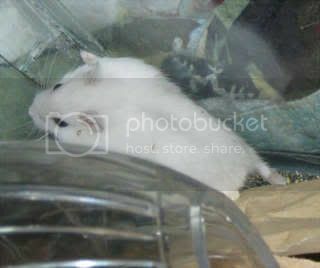 I also have my male hamster Gear, my female hamster Gimmick and my two ratty boys Marsh and Mallow who are all new. I didn’t have a good photo of Gear though so I’ll have to get a new one. Marsh (capped) and Mallow (siamese) - both male. They are currently in quarantine which is why they’re in an aquarium. They’ll be moved to the big rat cage later. they are sooooo cute! congrats on the new additions! makes me wants rats even more now! Yeah these guys are probably well over my 100th rats now if you include all the babies I’ve bred and sold. They’re coming along nicely but since they weren’t properly handled they aren’t as tame as most of my rats just yet. My babies I breed myself are very, very tame so I think I can tame these guys down given a few weeks. 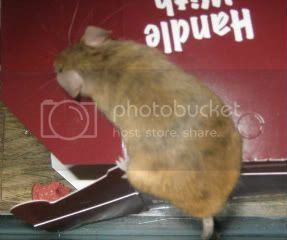 I already tamed the hamsters down to the point I can hold them without them freaking out.